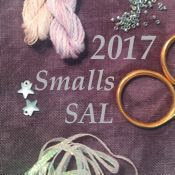 I started a large number of small for this month! 23 in total, all by Just Nan. This was for Kerry's Theme-tas-stitch March Madness where you had to stitch as many projects as possible in March. I had 8 projects already in the rotation so needed 23 more to make up the 31. Is that enough Smalls for you, Heather? 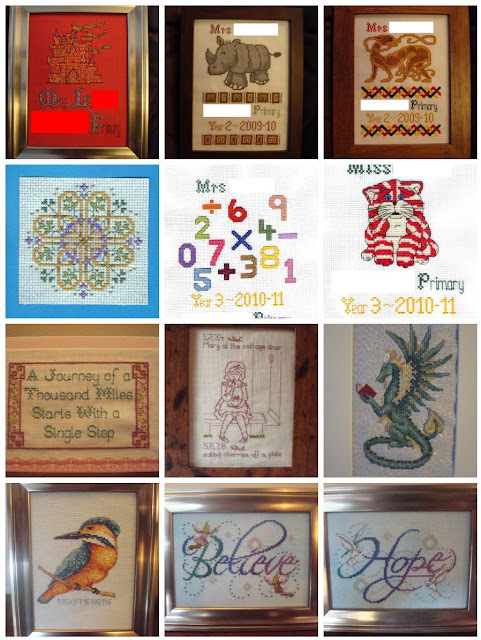 The last regular feature is the Stitch from Stash tally-up. I bought two bargain cross stitch books for 84p each and renewed my Just Cross Stitch subscription. Magazine subs are exempt from SFS so it was another good month for me. Finally we have a new Blogger of the Week, click on the link above and find out who it is. We will also have a special treat for the beginning of the month. I will be featuring a non-blogging stitcher. It may be an Instagrammer or a FlossTuber or some other social media. Or maybe a stitcher who just leaves comments but doesn't blog themselves. I would also like to feature non-English speaking bloggers. So if you know anyone who would like to be featured, please ask them to contact me by email. or Happy Dance if you don't want alliteration! Yes, Mary is finally finished, although not fully finished and framed yet. I started her on Friday 10th March and completed her on the 29th having stitched on her for 15 days in total. Close-ups to show the beads and the Kreinik. Lettuce Leaf which is a bright green and was supposed to be the lighter colour in the M. Instead I blended DMC 927 and 928. This will be framed and given to my cousin for her baby girl. Here are the other four letters I have stitched. Three have gone to my cousins and one is for me. Finally, don't forget to sign up to participate in the Easter Treasure Hunt Blog Hop! I intend to send out the letters to each person on Sunday 9th April so you have until then to make up your mind if you are wavering! That's actually a better colour likeness for the top fabric than previous photos. I was hoping to have a Happy Dance to share with you but alas, not today. 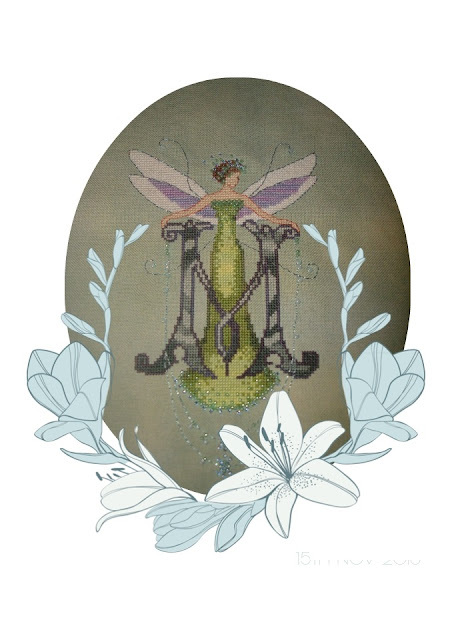 There is only the beading to do on M is for Mary. I was sitting down for an afternoon's beading today when the phone went. You know what it's going to be when they say "Hello, it's Mrs M here, he's OK but...". Yes, my son had injured himself at school. But not the Small Boy which you would expect, it was the Large Boy. His leg got in the way of a stone being chipped up when they were all running around and there was blood and plenty of it. Luckily hubby was here to go and collect him because it's a three mile limp home if Mum has to go. I did manage to bead the bottom of the skirt in between washing the trousers and administering to the wounded. A clean plaster and a chocolate muffin were applied. One to the leg and the other to the mouth! Then the Small Boy came home and the beads had to go away. I also realised that I was working away on the wrong project. 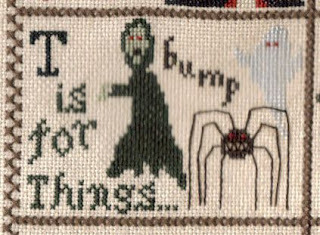 I picked up Happy Hallowe'en instead of the Stitcher's Alphabet which needs to be ready for The Alphabet Club this Saturday. Ooops. 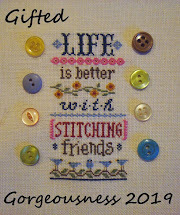 Never mind, I can start that tomorrow after another attempt at beading M.
Finally, it's a short post today so I will just remind people that I will be hosting an Easter Treasure Hunt Blog Hop on Good Friday. If you'd like to be a participant just leave a comment. I have had a good WIPocalypse month again. I worked on a total of 7 of my 17 projects. 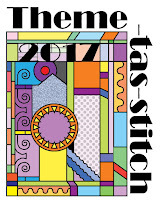 You will have seen photos of most of these on the Theme-tas-stitch post. Only the beads to be added so you are not seeing the full piece until then! 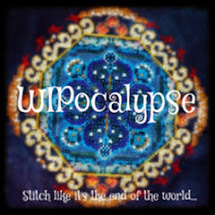 March – What stitchy blogs, groups, or flosstubes do you follow and why? I follow a large amount of blogs, you can see most of them in my sidebar. 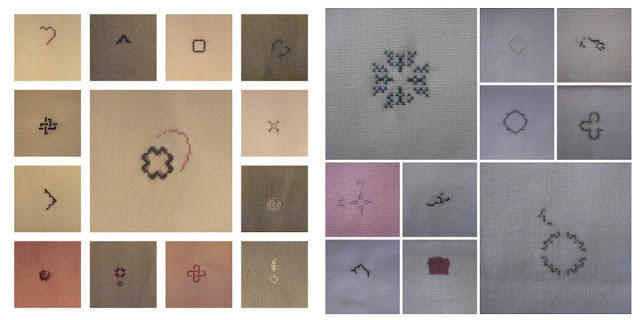 Blogs are my preferred way of connecting with other stitchers. You learn more about a person from their blog than from other social media and you can easily search for projects they have featured in the past. You leave a comment, they reply and you start a dialogue together. Of course we have our SALs, Blog Hops and Linky parties too. I belong to a few FB groups. I prefer the designer-specific groups where you will only see work from one particular designer and also comments from the designer themselves. 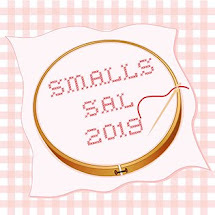 I do belong to a couple of general stitching groups which I joined for the themed SALs, something I love. I do subscribe to some FlossTube channels too. I love having someone chatting away while I stitch and I do feel that you really get to know a person when you watch their videos regularly. The main difference between FlossTube and a blog is that there is more of a "them and us" feel about it. "They" make the videos and "We" watch them. The watchers seem to regard the vloggers as "experts" and ask them all sorts of questions about stitching regardless of whether the vlogger does that kind of stitching or has more than a year's experience! 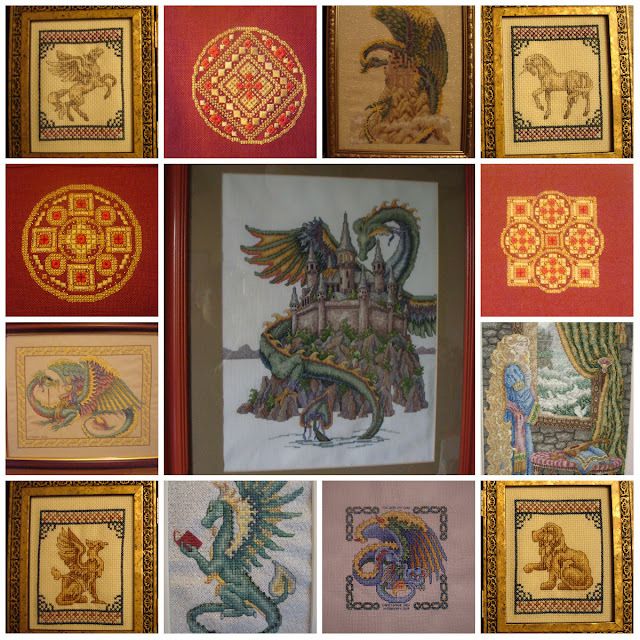 Many vloggers seem to be either new to the craft or older stitchers who have recently taken it up again. On the plus side, I love seeing what people's houses are like! I also love watching FlossTube channels made by my blogging friends, when I read their blogs I can do it in their voice now! FlossTube and FB definitely promote FOMO (Fear of missing out), Whether it's joining every SAL released, buying every chart you see, joining every Fabric of the Month club or having 90,000 needle minders there does seem to be a more manic approach to the hobby than I've seen on blogs or forums. There is a mood change just lately though, with the financial realities hitting people and Stitch From Stash taking off again. Crazes go in cycles in stitching as with everything else. Finally, we are approaching the Easter Holidays and there is still time to sign up for the Easter Treasure Hunt Blog Hop. The more people we have, the longer the mystery phrase will be. Just leave a comment if you'd like to be a participant. March Madness - Work on as many different projects as you can - you could do one a day or have a day when you see how many you can stitch on. 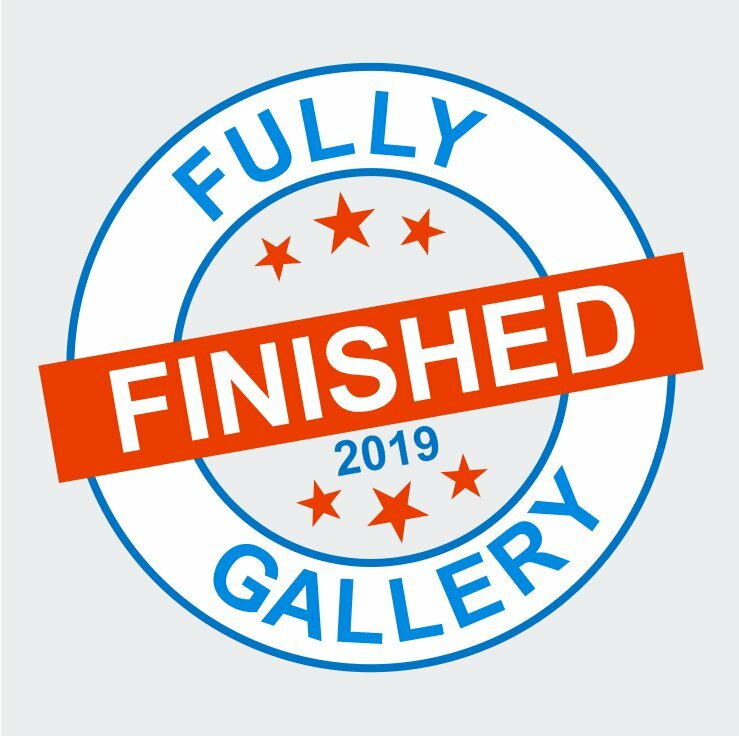 To reach 31 projects for the 31 days in March I needed another 24 projects. I didn't want to start pulling out other WIPs for just a length or two so I needed something small or a part-work. I considered an Advent Calendar (24 days) or another Alphabet (the Erica Michael's one has 24 blocks) but in the end I went for something totally different - a Just-Nan-athon. 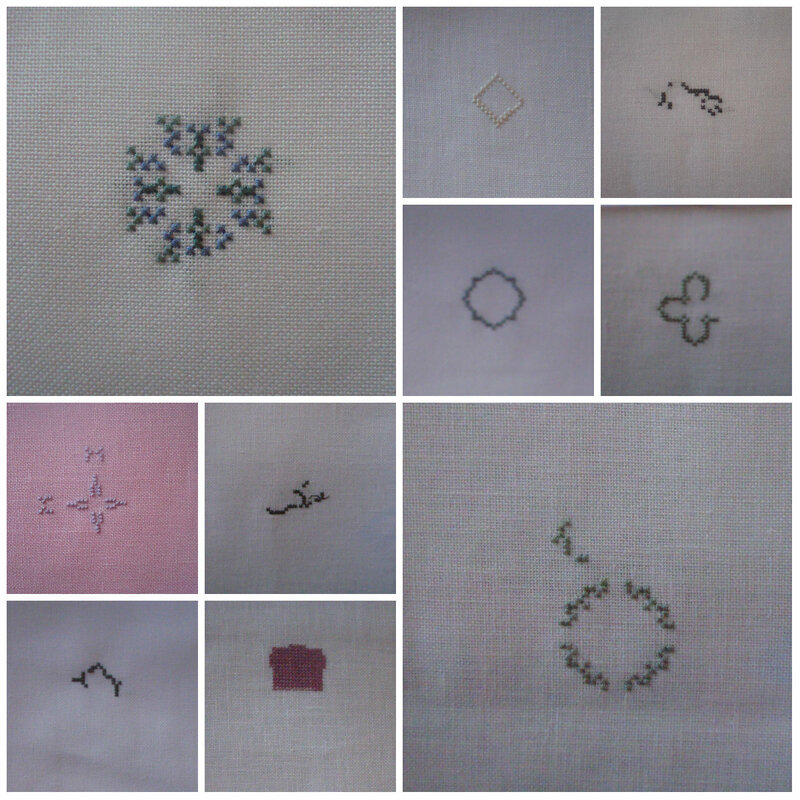 Over the years I have collected a lot of her small free charts and have stitched a few. Most days I did one length of thread immediately after my 10-a-Day project before I started anything else. The one in the middle got more done because I went to work that day and stitched during my lunchbreak. I am just picking fabrics as I go, all 32 count to keep the sizes the same but sometimes the charted colour and sometimes my own choice. I have 11 more to start for the rest of the month, one for each day and 2 on Saturday. When I started these I wasn't sure how I would continue with them but Linda had a great idea in her recent post called "So Many Stitches a Week" so now my plan is to pick one and work out how many stitches I need to make each day to finish it in a month. They average 40x40 but are not full coverage so there are probably only 800-1000 stitches in each one. Which is roughly 30 a day. So once March is done I am going to add one of these to the daily rotation and see how many I get done by the end of the year. Finally I wanted to say a Big Thank You to everyone who has visited and commented on the new Blogger of the Week Blog. We have featured three bloggers so far and have more lined up. I send a few questionnaires out at the beginning of each month to keep the answers fresh and current. If you would like to be featured in the blog please do email me. Also, could you talk about it on your blog to reach people I don't know! I would love to expand my circle of blogs and I am sure that you all have followers that I don't know yet. 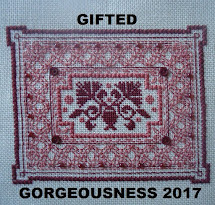 Welcome to the March link-up for Gifted Gorgeousness. The linky will stay open until the end of the month so you have plenty of time to join in. This month I have gifts from people and gifts for people, also stuff stitched with gifts from people and some actual gifts! The Sudbury leaflet has some great charts which would look good stitched over one, the fabric is a 32 count green Belfast which has been used already! The chart I had called for Rue Green and this was close enough as I had nothing else suitable in my stash. Perfect serendipitous timing. I think the pendant is Rose Quartz and it's very pretty, I will probably wear that to my Toddler Group tomorrow. Sarah offered two prizes and I had to choose this one because of the counting rhyme stitched on the pillow. The Small Boy loves numbers and when he started Preschool you knew where he was by the sound of his keyworker reciting number rhymes! There was also a big bag of vintage wooden cotton reels which I must find a project for! And now it's over to you. This is where you link up your post for this month. Please use your name or your blog name in the field and NOT the words "March Update" so I can easily see who has linked up this month. And link to the actual post, not just your blog. It is easier if you copy and paste the link, rather than typing freehand. Finally, don't forget to sign up for the Easter Blog Treasure Hunt Hop this year! Details in the previous post to this one. Here's some little gifts for you all from various designers. Hopefully you can find something suitable to stitch for the Hop! You do think of the most original presents; whoever thought of sending anybody three French hens? Do they really come all the way from France? It's a pity that we have no chicken coops, but I expect we'll find some. Thank you, anyway, they're heaven. You can see that I have started the long red outer border. Once that is completed there is a row of metallic on either side of it. All the way round the outside! Once I finished all the SALs for the month I turned to my focus piece. A new start with a deadline. Remember the Nora Corbett Letter Fairies I stitched last year for my cousins' children? Well, my younger cousin had another baby on New Year's Eve so we need another initial! I took that photo to ask for advice on the Mira board. 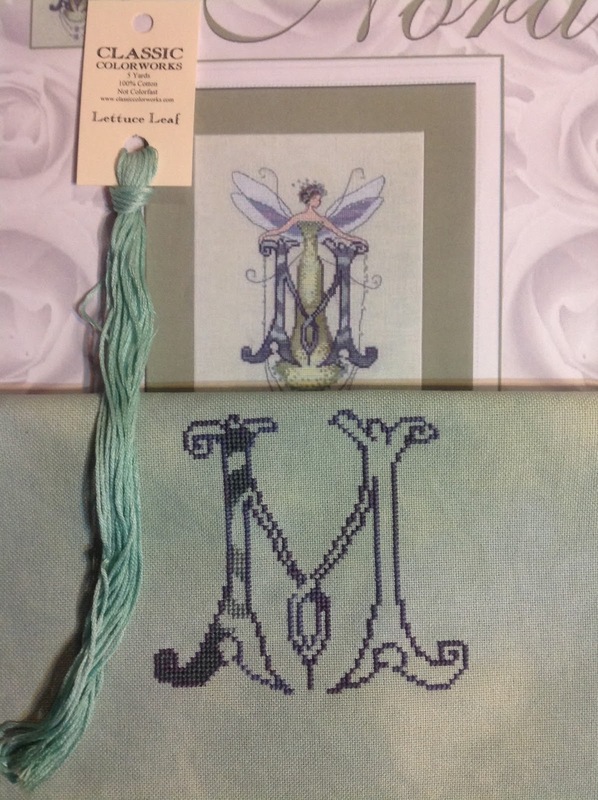 The outline of the M is Crescent Colours Smoke and the variegated fill-in colour is Dark Fennel. The charted colour for the rest of the fill-in is Lettuce Leaf, which you can see on the left. You can see that looks nothing like the cover photo and doesn't go at all with the dress either. So I used a blend of 927 and 928 DMC, which looks lovely in real life. The colours are not coming out true at all tonight. Honestly, the fabric looks grey there! It is really green, Sunlit Heath from Crafty Kitten. These stitch up so quickly, especially when you park yourself down and focus for three days! I did do some FFO'ing this afternoon but I can't show you yet as it's a gift. I also figured out my solution to Kerry's Theme-tas-stitch for March so you'll see that on the 21st. We had our second interview of the Blogger of the Week blog. Pop over there to read more about the lovely blogger featured this week and make sure you visit her personal blog too. Finally, we are approaching the Easter Holidays which means only one things - Chocolate Eggs! NO - Easter Blog Hops! As usual I will be hosting an Easter Blog Hop with a Treasure Hunt for the Mystery Phrase. Provide your own eggs! If you would like to take part this year, just leave a comment here. The week before Easter I will send you a letter of the alphabet which will form part of the mystery phrase. On Good Friday you will post that letter along with a photo of something seasonal that you have stitched (could be Easter or Spring or just something cheerful and sunny or floral). We all hop around like little bunnies to find the Mystery Phrase! Hallowe'en and Christmas Stitching and Easter too! 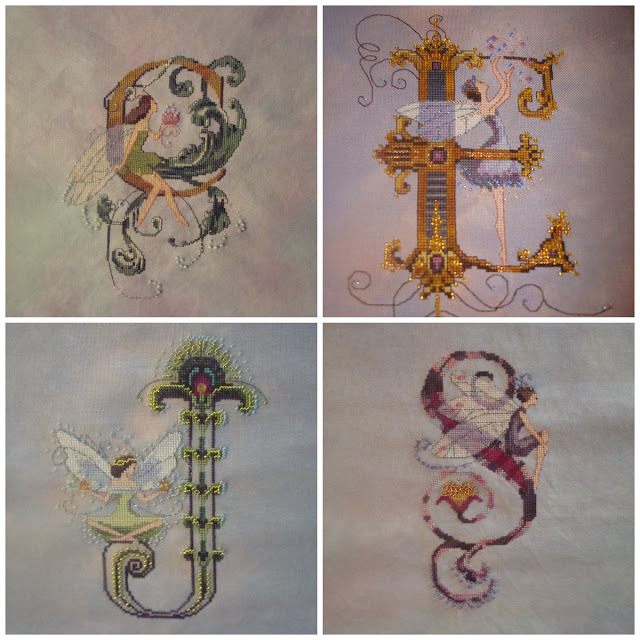 As I mentioned in my interview on the new Blogger of the Week Blog, my current rotation starts with The Enchanted Alphabet, followed by The Stitcher's Alphabet and then the two Ornie Blogs - Hallowe'en and Christmas. For both of those I am stitching a portion of a larger design with the aim of completing two large WIPs by the end of the year. Why will the fabric colour not come out right? stitched on the same fabric. My Christmas design is The 12 Days of Christmas by Joan Elliott and I have reached Block 3, although I haven't quite finished it yet. I just wanted to get a blog post up today! I have been diligently working my way round the border every evening. Most recently I have been stitching the blue snowflakes in the corners. Then it will be more dark red lines followed by another double row of metallic! 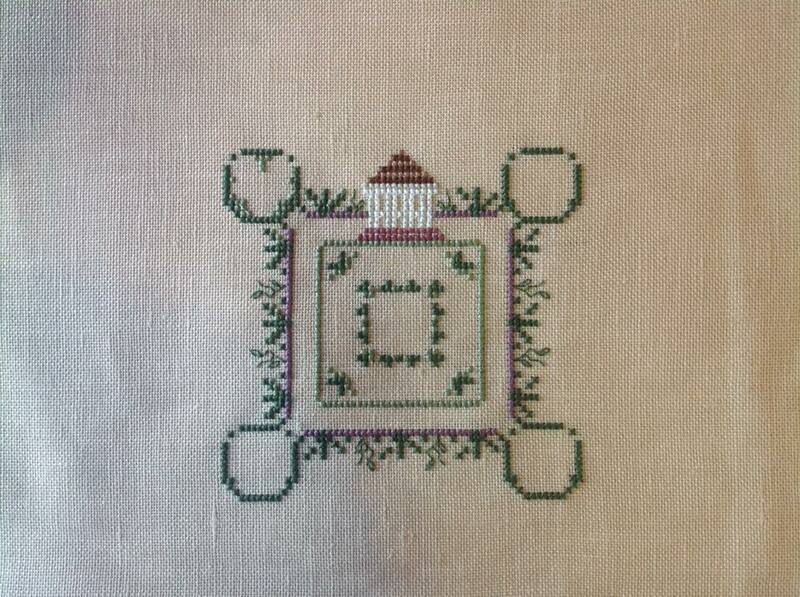 Once I finish those I will start on the vines between the two rows of border. 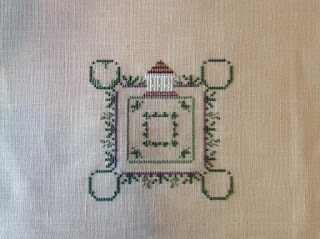 I have a feeling this border will be my evening stitching for the entire year! I hope to finish the French Hens and the red in the left-hand angel tomorrow. T is for Things that go bump in the night from A Dark Alphabet by A Note of Friendship. The charts are no longer on the blog but do drop Julie and Becky an email if you are interested in stitching the design yourself. 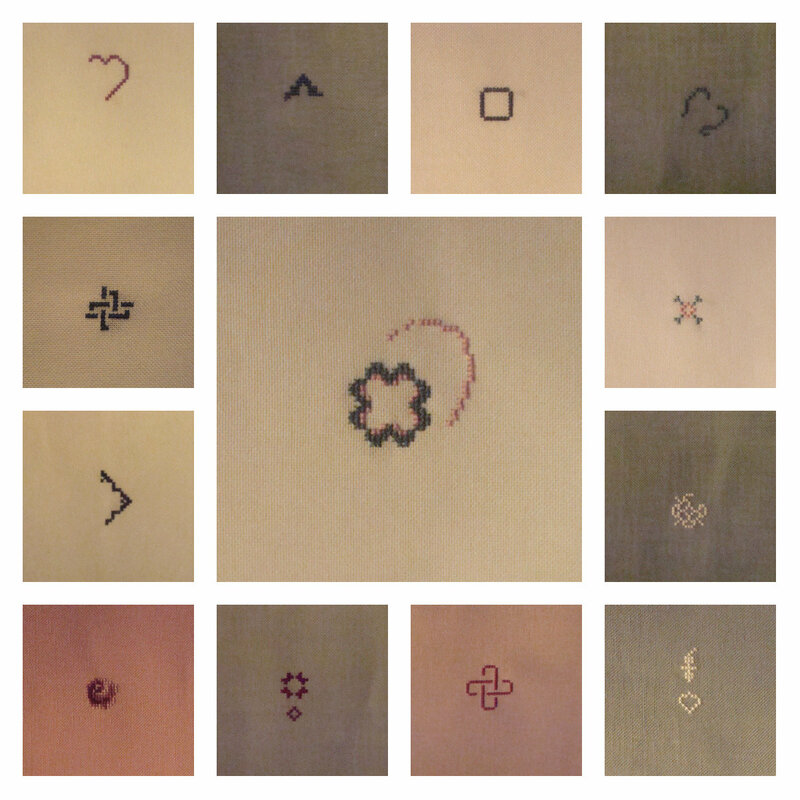 T is for Tatting and Thimble as seen in this month's block from the Stitcher's Alphabet by Brooke's Books. Do not speak to me about this block. If the Queen Stitch featured as one of my favourites then the Lazy Daisy is NOT. I loathe these things but there was no getting away from them for this block. I have the remaining three Byzantine Ornaments on my "17 in '17" list this year along with Twelve Days of Christmas by Joan Elliott. My blog roll has a lot of T blogs but I ignored all the ones beginning with "THE" or we'd be here for ever! 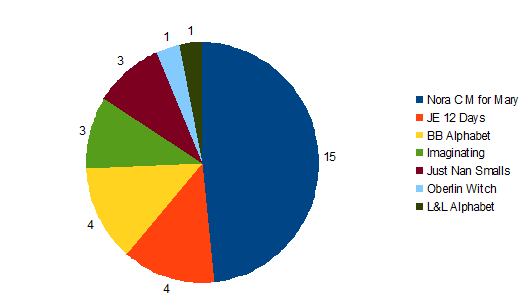 There's a whole lot more who haven't blogged for over a month but there's quite enough there to be going on with. I have sent some questionnaires out to various bloggers and we will feature one interview per week. Usually on a Friday because that's when I have the most time. If you would like to be featured, please email me and I'll add you to my list. Also, please promote on your blog because I would love to have new-to-me people to interview too.